Our product range includes a wide range of commercial boiler. Since its establishment before 2 Decades, Balkrishna Boilers Pvt. 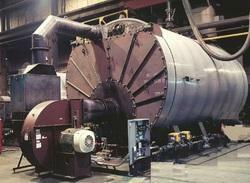 Ltd. has focused on developing innovative technologies in process heating. We are leading manufacture of Commercial Boiler. The expertise, knowledge, goodwill and experience garnered over 20 years based on servicing & catering to the demanding needs of industries in probably all types of fields and areas of applications has equipped us with the insight of implementing the best solution for a given application & fuel requirement.